Who said the best schnitzel has to be chicken? Use pork leg steaks instead and let me tell ya, it is sure to beat the hell out of chicken schnitzel any day. Flatten the pork and crumb using the flour, eggs and then breadcrumbs. Deep fry until cooked through and golden. Reduce the cider in a large pot by half, add water, KNORR Rich Brown Gravy, COLMAN'S Dijon Mustard and Maple syrup. Bring to the boil whilst stirring, allow to thicken. Combine the slaw ingredients together and store for use. 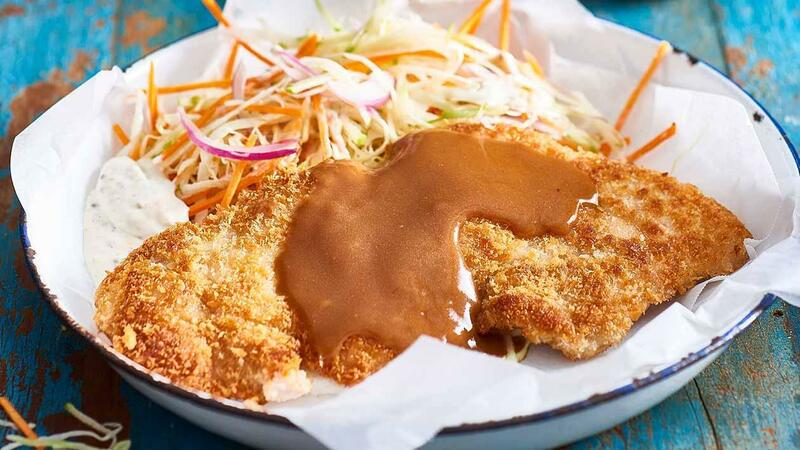 Serve the pork schnitzel with gravy and slaw.